Vespa is a state of mind, it’s authentic and it is freedom. Our tours are especially designed to give you an aperçu of the city. In this tour you could chill while your guide drives you through the best sites and hidden places of Madrid. You will visit and discover hidden places most of "madrileños" don't know. You can choosing between enjoying a picnic or some of the best tapas! 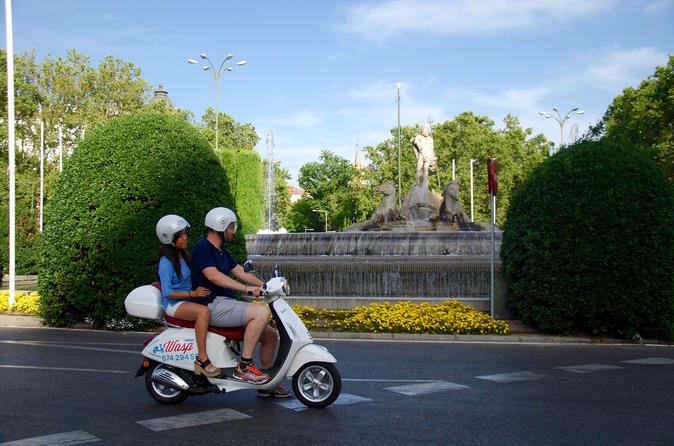 Starting from our parking located at Calle Juan de Urbieta 21 or we could pick you up as an extra (ask for conditions), our guide will drive you during around 2h and 30 min through the best places of Madrid. Going from the most popular spots to the hidden places which are only known for local people. During the tour we'll do a stop to enjoy a picnic or some tapas depending on the option you have choosed.